Update municipal plans - revise town-level plans to address climate change impacts. 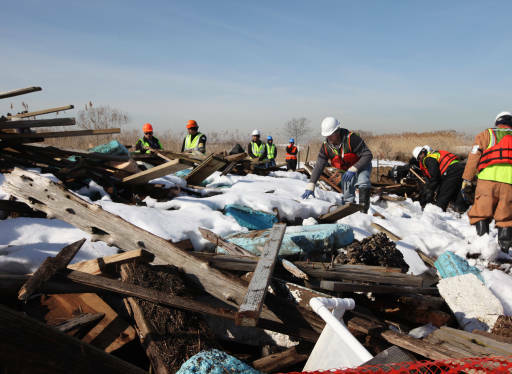 Workers clean up debris from Hurricane Sandy on Lido Beach, NY. Credit: Margie Brenner, US Fish and Wildlife Service. Hazard mitigation is the effort to reduce loss of life and property by lessening the impact of disasters. It is most effective when implemented under a comprehensive, long-term mitigation plan1. State, tribal, and local governments engage in hazard mitigation planning to identify risks and vulnerabilities associated with natural disasters and develop long-term strategies for protecting people and property from future hazard events. Mitigation plans are key to breaking the cycle of disaster damage, reconstruction, and repeated damage. Climate change in Massachusetts is expected to bring more severe storms more often with more flooding. While often these storms will come in the summer, it may also mean more big storms in the winter with excessive snow, as we saw in 2014. While there will be bigger storms, there is likely to be draught as well during the summer months, along with more intense heat waves. These weather changes make many native species and ecosystems vulnerable, which may lead to more tree damage and fires. Find strategies that can address more than one risk and increase efficiency. 1. Organize Resources – At the start, the community should focus on assembling the resources needed for a successful mitigation planning process. This includes identifying and organizing interested stakeholders, as well as securing needed technical expertise. 2. Assess Risks – The community needs to identify the characteristics and potential consequences of hazards. It is important to understand what geographic areas different hazards might impact and what people, property, or other assets might be vulnerable. The risk assessment is the appropriate place to include a climate projection and vulnerability analysis. Identifying socio-economically and climate vulnerable neighborhoods as well as vulnerable ecosystems and species areas is also appropriate here. The findings in this section can then be used to evaluate actions on the next phase of the report. 3. Develop a Mitigation Plan – Based on an understanding of risk, it’s important to set priorities and develop long-term strategies for avoiding or minimizing the undesired effects of disasters. Future climate and vulnerabilities should be part of the risk assessment. For instance, in a coastal community that is likely to experience sea level rise, a hazard plan should address the need for the dune system and marshes to retreat so that they can continue to provide essential protection services during a hurricane or other storm. Off-shore reefs may be essential to reducing the impact of waves. Therefore, long-term planning for wider foreshores and reef restoration becomes part of climate-aware hazard planning. In another example relevant to coastal communities, intrusion of sea water into septic and drinking water supplies is increasingly likely as sea levels rise. For inland communities, climate change increases the likelihood of public health impacts from excess heat; plans for bringing elderly populations to cooling centers can help minimize serious health risks. A good hazard mitigation plan will address all of these forward risks. 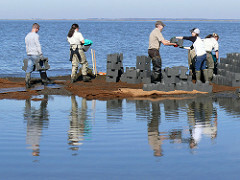 Partners creating "oyster castles" as part of a post-Hurricane Sandy living shorelines project in Downe Township, New Jersey. Credit: Mary Conti/TNC. 4. Implement Plan and Monitor Progress – The state, tribe, or community can bring the mitigation plan to life in a variety of ways, ranging from implementing specific mitigation projects to changing aspects of day-to-day organizational operations. It may be helpful to identify pilot projects that can be fairly easily undertaken to test more innovative actions. Examples could be putting in a small artificial reef and testing the amount of wave energy reduced or designing one part of an urban park to be floodable space and monitoring the amount of water that is absorbed. These steps also build political support for larger action as effectiveness and public reception is proven. To ensure success in ongoing implementation, it is critical that the plan remain relevant. Thus, the state, tribe, or community should conduct periodic evaluations to assess changing risks and priorities and make revisions as needed. Pre-Disaster Mitigation Competitive (PDM-C). The PDM Program, authorized by Section 203 of the Robert T. Stafford Disaster Relief and Emergency Assistance Act, is designed to assist States, U.S. Territories, Federally-recognized tribes, and local communities in implementing a sustained pre-disaster natural hazard mitigation program. The goal is to reduce overall risk to the population and structures from future hazard events, while also reducing reliance on Federal funding in future disasters. This program awards planning and project grants and provides opportunities for raising public awareness about reducing future losses before disaster strikes. Hazard Mitigation Grant Program (HMGP). The purpose of the HMGP program is to help communities implement hazard mitigation measures following a Presidential major disaster declaration. Hazard mitigation is any action taken to reduce or eliminate long term risk to people and property from natural hazards. Mitigation planning is a key process used to breaking the cycle of disaster damage, reconstruction, and repeated damage. The HMPG is authorized under Section 404 of the Robert T. Stafford Disaster Relief and Emergency Assistance Act. State, tribal, and local governments engage in hazard mitigation planning to identify risks and vulnerabilities associated with natural disasters, and develop long-term strategies for protecting people and property from future hazard events. Flood Mitigation Assistance (FMA). The FMA program is authorized by Section 1366 of the National Flood Insurance Act of 1968, as amended with the goal of reducing or eliminating claims under the National Flood Insurance Program (NFIP). FMA provides funding to States, Territories, federally-recognized tribes and local communities for projects and planning that reduces or eliminates long-term risk of flood damage to structures insured under the NFIP. FMA funding is also available for management costs. Funding is appropriated by Congress annually. Water Resources Protection, Hazard Mitigation: The Hazard Mitigation Program in Massachusetts is jointly administered by DCR and the Massachusetts Emergency Management Agency (MEMA). More information on hazard mitigation can be found on the MEMA website. Floodplain Management: the Department of Conservation and Recreation (DCR) Flood Hazard Management Program (FHMP) is the State Coordinating Office for the National Flood Insurance Program (NFIP). FHMP program staff work with FEMA and officials from NFIP participating communities to implement the NFIP in Massachusetts. The FHMP is a technical assistance program and has no regulatory authority. Program staff is available to provide technical assistance to all interested parties on issues such as the NFIP, floodplain management, floodplain building requirements, floodplain mapping, flood mitigation, and flood insurance.